Former Senate Leader Ali Ndume has accused Senate President Bukola Saraki of personalising the chamber, and has said plans to impeach him are still alive. 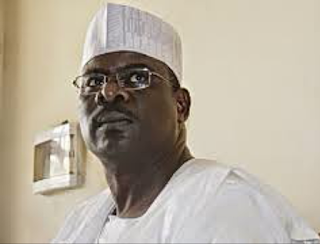 Ndume said at a News Agency of Nigeria (NAN) forum in Abuja yesterday that he would not be bought over with his appointment as chairman of the Committee on Establishment and Public Service. The lawmaker from Borno is one of the All Progressives Congress lawmakers insisting that Saraki must vacate his seat following his defection from the party to the opposition People’s Democratic Party (PDP). He had a running battle with Saraki, following his supposed support for the Executive against decisions of the National Assembly. He was also stripped of his position as Chairman of the Committee on Independent National Electoral Commission (INEC). Ndume said he regretted supporting Saraki to emerge as senate president and alleged that he (Saraki) is running the affairs of the senate like a private business. “Saraki is not supposed to give out committees because they do not belong to him. He has personalised the senate and he is becoming like the senators’ president not senate president. “The Selection Committee is the one with the mandate to give out committees. The committees do not belong to Saraki,” he said. The lawmaker reiterated he would not be carried away by the position and stressed that it was not a big deal. He also said he does not need to head any committee to provide service to the people as a senator.